Watches are labeled “cult” when they have a certain history or status amongst collectors. Last week, MotoringExposure covered the Omega Speedmaster a.k.a Moonwatch as being a cult watch. This week, we decided to grab another cult watch and this is perhaps the most recognized cult watch of all: The Rolex Submariner. To be honest, we could have picked almost any other stainless steel Rolex model and point it out for being a cult watch. However, the Submariner (or Sub) is probably the one to cover first. The Submariner (ref.6204) was introduced somewhere between 1953 and 1954, with a modest diameter of 37mm and had a certified chronometer movement ticking inside. Introducing various models between the mid-1950s and the late 1950s, the first Submariner that resemble the modern Submariner is the ref.5512, introduced in 1959. With a water resistance of 200 meters and the modern Rolex caliber range 15×0 (1530, 1560 and 1570) this model survived the Rolex collection from 1959 till 1978. In 1962, Rolex introduces a cheaper version that does not have the chronometer graded movement. 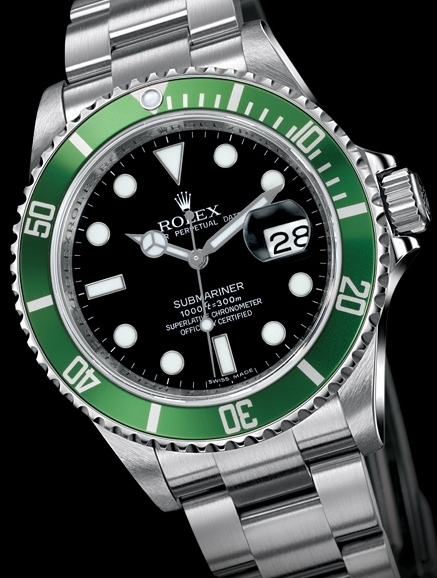 This version, the ref.5513 Submariner is very similar to the ref.5512, both lacking a date feature. Do not think these watches came cheap in those days, it were real expensive watches back then (relatively). The most famous wearer of these first Rolex Submariner no-date versions is probably James Bond, in Dr.No. 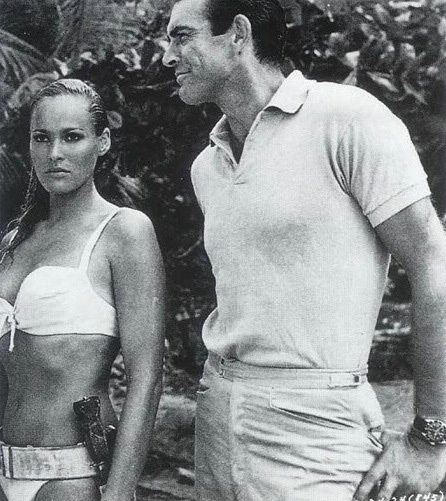 However, in Dr.No he wore a no-crown guard version of the Submariner, so one of the predecessors of the 5512 Submariner. A nice Rolex Submariner 5512 fetches far over 10K USD these days, the prices of the non-chronometer ref.5513 start at around 4-5K USD, but rapidly increases as the watch is in nice condition, complete with box and papers or when it’s having certain highly sought after characteristics (like a gilt-dial). You better start looking in your father’s drawer if you can find something like this laying around. 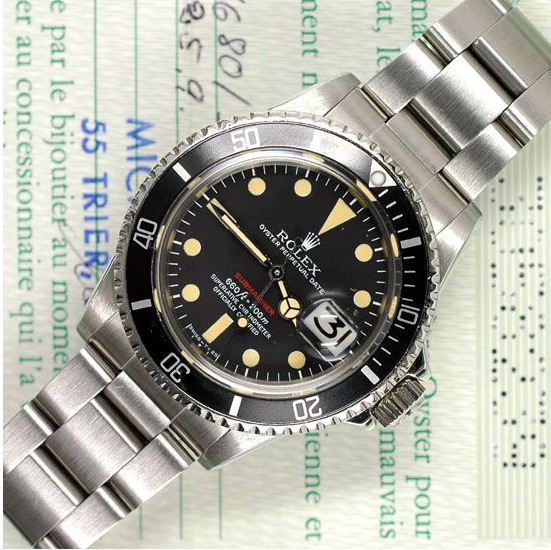 Our own favorite vintage Rolex Submariner is the ref.1680 model, with a date feature. 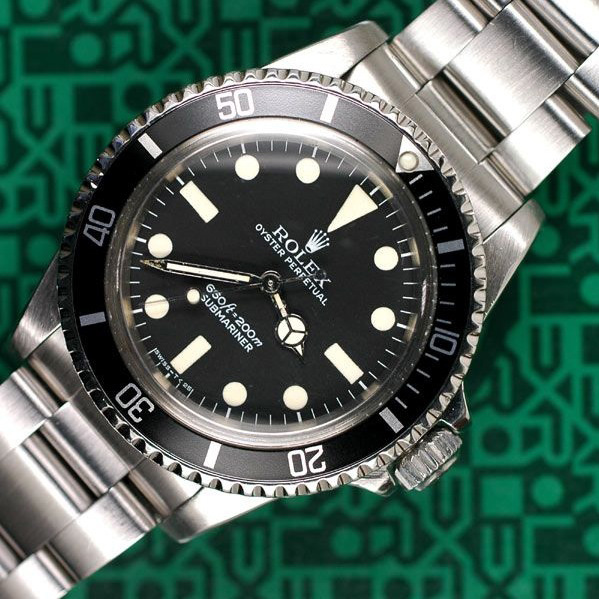 Introduced in 1967, Rolex came to its senses and thought it might be useful for divers to have a date window. When you hear collectors talk about a Red Submariner , it is the ref.1680 model. When Rolex started to use sapphire crystals and the newer type movements in these Submariners, talking 1980s here, it didn’t take long before the former plexi crystal models got sought after. If you bought one then, you are a lucky guy now. The current Submariner is no punishment either, it carries a lot of DNA from the first Submariner models and is a pleasure to wear on your wrists. The ref.16610 is the actual reference number for the stainless steel Submariner Date model. However, since Rolex introduced the all gold and bi-color models with their new DNA (bulkier lugs, ceramic bezel, enhanced bracelet and clasp) during the two previous BaselWorld expos in Switzerland, rumours are going on that the new stainless steel model will be introduced in just short time from now. Also worth mentioning is the Green Submariner (16610LV) or Kermit, as collector tend to name it after our furry friend from the Muppet Show. 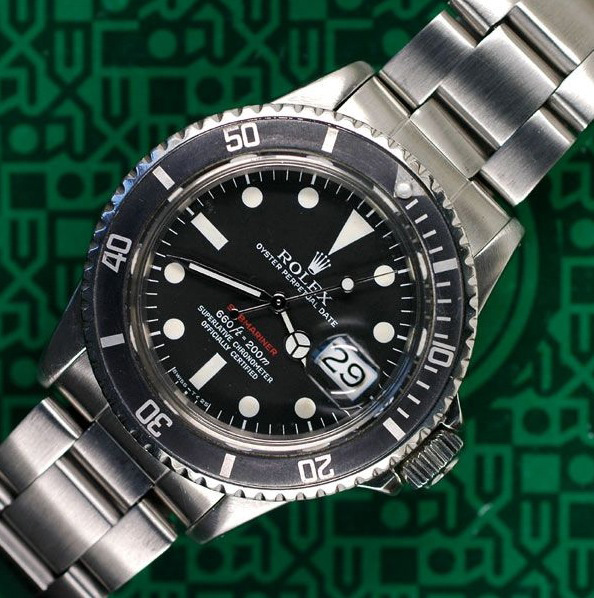 It is a time limited edition to celebrate the 50th anniversary of the Submariner, however, Rolex is always being vague about production numbers or years, so the production could stop just tomorrow. Problem with cult watches is that they have been covered so much and in to such an extent, almost every article would fail to do justice to these timepieces. If you want to become a subject matter expert, make sure you visit a few of the on-line forums or blogs specialized in vintage Rolex and get literature from Mondani Editore on this topic. Pictures courtesy of SubGMT.com – with the exception of the screen grab of James Bond Dr. No. Wednesday Watch – Following The Auctions, Beyond All Realism?